ROAD TOWN, Tortola, VI: The infighting and division in the ruling National Democratic Party (NDP) continues to be noticed by the public. The Hon Myron V. Walwyn’s wing of the party appeared on ‘NDP Radio’ last evening Monday, October 29, 2018, for a two-hour show. One caller asked where were the other Ministers, as again, for the third time noticeably absent were two NDP founders, Hon Ronnie W. Skelton (AL) the Minister for Health and Social Development and Deputy Premier and Minister for Natural Resources and Labour Dr the Honourable Kedrick D. Pickering (R7). The show spent most of the time paying tributes to the late Hon Delores Lettsome-Christopher (R5) who died on October 16, 2018, along with a well know NDP supporter from Virgin Gorda, Bernice Sprauve. 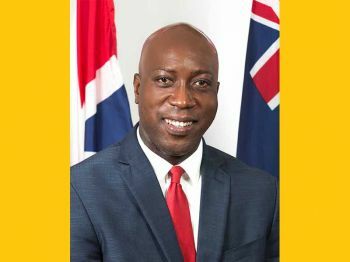 Since Hon Walwyn became the Chairman of the NDP, there has been a split in the party and it is unclear what will happen during the By-election to fill the fifth district seat. The By-election is expected by late December 2018. The Walwyn wing will be running former Legislator and party hopper Elvis J. Harrigan and the Skelton wing will be running Wade N. Smith the Comptroller of Customs. The Virgin Islands Party (VIP) Candidate is Commissioner of Motor Vehicles Mr Kye M. Rymer. What about the Ronnie wing, suppose someone wants them, how do you choose? There is only one NDP. The NDP that establish rules and process that all agreed with. Its those same rules and process that gave Myron the NDP leadership..They need to respect and accept that and stop allowing hate and pride to dictate for them..
To @ Just Saying. keep it real: You seem to be living in a different world. NDP as it now and for that so called election for the leadership did a lot of wrong doings to get Myron elected. Sadly a lot of the delegates only found out after the fact. Some of the very people involved were out bragging what they did to control the election the way they wanted it to be. Some persons had the courage to say how they received monies to vote for Myron. And there is a lot more that can be said but it will not be said here. STOP FOOLING PEOPLE ABOUT THE SAME RULES WERE FOLLOWED FOR THEIR IS AMPLE PROOF TO DEBATE THAT! The party is now hurting and the newly elected leader and his cronies do not know what to do. That certainly does not speak well for the party. U R playing Monday morning quarter backing.. Digging up all kind of excuses to diminish a legal, normal accepted process. He won.. Let it go. Rhymer will win this. Easily.. 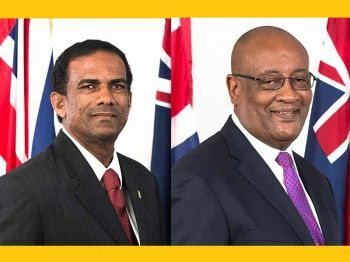 Even Zoe was a better Choice than Juggy.. Will Smith will pay for NDP failures..
Two guys don’t want anything to do with Myron. They have lans to take back their party from him. You mean NDP VIP is sad news, we need new blood. Humility......Ego........Greed.......Power...... "People who are not willing to follow are not prepare to lead"
Choice....Destiny....Love for country.... I so disagree with you. My parents taught me, as I'm sure many other parents did their children, to be careful who you hang out with and who your friends are. My grandmother on the other hand used to say "you don't see fowl backside until the wind blow". I say this to say, everybody has a choice. If your destiny and your goals no longer align with mine, I can change and should change course. For each human fulfilling your own destiny is paramount. Putting people first is in my opinion the main characteristic of being the people's servant. Gaining power by any means necessary does not meet that criteria. Free drinks at every bar on the island and fake promises even during small internal elections without sitting and bringing solutions of how to deal with the way the use of drugs and alcohol is tarnishing the very fiber of our community is not fair play. Throwing daggers and finding fault without solutions, real solutions to the problem that plague our country again is not fair play. Some will say politics is a dirty game, but as one who loves the Lord, 'dirty' will never get my vote. Personally, I look at the heart and what I see there is where I will vote this coming election. Someone with a heart for my country and not for power "by any means necessary". Doctor smith was elected by the people and voted as Premier through a Democratic process. Hate or like him its an established Democratic process and everyone respect that and went along.. Myron should be given that same respect and opportunity. They have to look into the mirror and figure out why and how Myron defeat them in the process congrstulate him and accept it. And quit the leadership of division. Respect is not given. It is earned. That boat has sailed. There is no longer a divide. It is a total separation and if those guys move out of Cabinet, Myron can lose his Government before the next election, so be careful what you wish for. Myron was warned this would happen. He proceeded anyway. Every decision has consequences. Sometimes, you cannot assume you are the leader, you have to wait until it is agreed that you are. No matter how this all turns out, people trusted doctor smith. he may have been rendered incompetent after a while but the next election will determine who the people trust with this territory. Every political party has a leader and the election belongs to him or her. Stay tuned. You are missing the point.. Thus is not about emotions, warnings or personal feelings.. This is all about a process a normal established Democratic process that many quality and qualified members took part in. The process says Myron won.. Why the fuss.. Let's say Ronnie did win via the same process..Then its a fair process.. U all sick.. I am sure if either Ronnie or kedrick had won Myron would respect that decision and support the leader..
U have your facts wrong. Myron is the one why NDP won all 4 at large seats.. Myron is very popular with belongers who are 45% of voters. I do accept that Indigenous BVI Landers isn't in favor of Myron.. The truth is a reality. Belongers are More in numbers. "Sad" Do your research. What we have are the few speaking louder than the many. Myron will will his seat. Let me make a call. VIP will get 2 at large and Myron NDP will get the other two. Foreign nationals must not be premier in the Virgin Islands. They came here begging for bread but it seems bread is not enough for them.